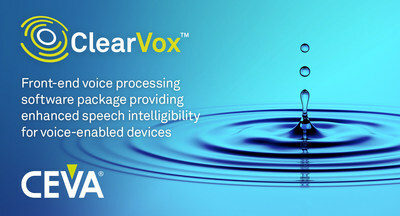 LAS VEGAS, Jan. 8, 2018 /PRNewswire/ -- Consumer Electronics Show -- CEVA, Inc. (NASDAQ: CEVA), the leading licensor of signal processing platforms and artificial intelligence processors for smarter, connected devices, today introduced ClearVox, a new software suite of advanced voice input processing algorithms aimed at enhancing speech intelligibility and voice clarity for voice-enabled devices. ClearVox is licensed exclusively for the CEVA-TeakLite-4 and CEVA-X2 audio/voice DSPs. As voice becomes the primary user interface for cloud-based assistant services, a clean voice signal in any given environment is mandatory to ensure accuracy and intelligibility by conversational assistants such as Alexa, Baidu's DuerOS, Bixby, Cortana, Google Assistant and Siri. Headsets, smart speakers, mobile phones, wearables, automotive infotainment and home security systems are just some of the sizeable markets that vendors and chipmakers are targeting with voice-enabled services. However, they face significant technology barriers to incorporate and configure complicated algorithms such as multi-mic beamforming, multi-channel acoustic echo cancellation and noise suppression in their products. To reduce the significant barriers-to-entry for these markets, CEVA has introduced the ClearVox voice input software package. Developed in-house and leveraging CEVA's vast expertize in audio and voice processing, ClearVox incorporates advanced algorithms that cope with different acoustic scenarios and microphone configurations, including optimized software for speaker direction of arrival, multi-mic beamforming, noise suppression and acoustic echo cancellation, as well as the related firmware and driver software. It is offered in two pre-packaged software form factors: one for near-field applications including headsets and wearables, and the other for far-field applications targeting the emerging smart speaker, infotainment and other advanced voice-enabled applications. The accompanying SDKit is available for customers to configure and adopt ClearVox to their unique product specifications, such as the number and geometry of microphones, echo tail length and more. Erez Bar-Niv, Chief Technology Officer at CEVA, commented: "Voice input technologies are some of the most complicated and diverse algorithms to design, yet have become a 'must-have' for every voice-enabled device. Our ClearVox technology takes advantage of the latest academic research in algorithms for beamforming and signal direction of arrival to achieve a truly robust and exceptionally clear voice signal, regardless of background noise, acoustics, environment or product design. Our customers can now benefit from a single-source offering for the complete voice input solution, both the DSP and the software reducing design complexity and their time-to-market." CEVA will be demonstrating the ClearVox suite of technologies in its private meeting suite at CES 2018, January 9-12, 2018. To schedule a meeting and experience ClearVox first-hand, email sales@ceva-dsp.com.